Federal Reserve Chairman Ben Bernanke on Friday called for banking supervisors to pay "close attention" to compensation practices as they examine the soundness of financial institutions. Banking regulators have observed that "poorly designed compensation policies can create perverse incentives that can ultimately jeopardize the health of the banking organization," Bernanke told a meeting of smaller "community" banks. The Fed chief's remarks come amid public and congressional outrage over millions of dollars in bonuses paid to employees of American International Group Inc., which has been bailed out by the government four times. The situation has created a public relations headache for President Barack Obama and unleashed fresh congressional furor over the handling of AIG's bailout by the Treasury Department and the Fed. Bernanke, who will appear before Congress on the AIG flap next week, didn't mention any companies by name in his speech. He made a fresh pitch for an overhaul of banking regulations to prevent another financial crisis like the one gripping the U.S. and other countries worldwide. Regulatory gaps need to be closed, he said. Regulators must make sure financial companies have a sufficient capital cushion against potential losses. And Congress must enact legislation so that the failure of a huge financial institution can be handled in such a way to minimize fallout to the national economy - similar to how the Federal Deposit Insurance Corp. deals with bank failures. Such "too big to fail" companies must be subject to more rigorous supervision to prevent them from taking excessive risk, Bernanke said. Obama said Wednesday his administration soon will propose new financial industry oversight that includes a resolution authority with powers similar to those of the FDIC, which can seize control of banks, take over their bad assets and sell the good ones to competitors. The proposal would give the Treasury secretary the power, after consulting with officials at the Fed, to take control of a major financial institution and run it. The Treasury chief is an official of the administration, unlike the FDIC, which is an independent regulatory agency. On compensation, Bernanke said management policies should be aligned with the "long-term prudential interests of the institution ... (and) provide appropriate incentives for safe and sound behavior." "Supervisors must pay close attention to compensation practices that can create mismatches between the rewards and risks borne by institutions or their managers," he said. Rep. Barney Frank, chairman of the House Financial Services Committee, on Thursday sent a letter asking the Federal Housing Finance Agency, which regulates mortgage finance companies Fannie Mae and Freddie Mac, to cancel retention bonuses for hundreds of executives approved for this year and next. But Fannie Mae Chief Executive Herbert Allison warned Friday that canceling bonuses for workers at institutions receiving federal bailout money could undermine his company's efforts to stabilize the U.S. housing market. Fannie Mae plans to pay retention bonuses totaling at least $1 million over two years to four key executives. Freddie Mac is planning similar awards, but hasn't reported which executives will benefit. For strengthening regulations, Bernanke said steps should be taken to make the U.S. financial system less susceptible to "exuberant booms and disastrous busts." The patchwork of U.S. financial rules dates to the Civil War. Congress, the administration and the Fed are working on ways to overhaul the regulatory system to better protect against any future financial crises. Government bailouts of AIG, Citigroup Inc., Bank of America Corp., and others have put billions of taxpayers' dollars at risk over the past year and angered the American public. "These actions have involved extremely unpleasant and difficult choices," Bernanke said. However, a failure of a huge, globally interconnected company would have had potentially devastating effects on the financial system and the broader economy. 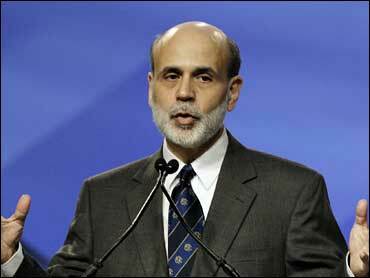 "I do not think we have had a realistic alternative to preventing such failures," Bernanke said. The Fed's $1.2 trillion bid Wednesday to lower interest rates to get Americans spending again is intended to improve conditions in credit markets, which would help revive the economy, Bernanke said. The timing of an economic recovery hinges on whether the Fed and the Obama administration are successful in stabilizing the financial system. Asked if he thinks the recession is going to end this year, Bernanke told 60 Minutes correspondent Scott Pelley, "In the sense that this decline will begin to moderate and we'll begin to see leveling off. We won't be back to full employment. But we will see, I hope, the end of these declines that have been so strong in a last couple of quarters." When the financial system shows signs of recovery, the Fed will begin to wind down its special loan and debt-buying programs. "So we are very much aware that we won't be in the credit markets forever. We need to help them now. But we want to have an exit strategy and allow those markets to recover and become, once again, fully private sector," Bernanke said after his speech.